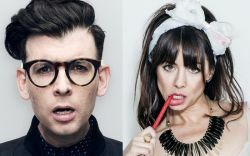 Natasha Leggero & Moshe Kasher: The Endless Honeymoon. Moshe Kasher. Comedian. Child Genius. Jew. Jew Comedian. OBGYN. Pleasure center. Good tipper. Guiding light. Beefcake. Featured on: NBC, E!’s "Chelsea Lately," "Late Night with Jimmy Fallon," Comedy Central’s "Drunk History," "@midnight," "Conan," "Carson Daly," Showtime’s "Shameless," MTV & more… Currently the Co-host of "The Champs" podcast and the author of the acclaimed memoir "Kasher In The Rye" on Grand Central Publishing. Selected as one of Variety Magazine’s “Ten Comics to Watch”, LA Times’ “Faces to Watch”, and iTunes’ “Comic of the Year”.Things people have said:“Everything you want in a comedian” – East Bay Express“Displays a fiery frustration and agile, confident showcase of his neuroses” – SF Examiner“Smart, dirty, sharp, self-deprecating and ultimately hilarious” – Denver Post“[With] a powerful comedic voice and amazingly wide range…(He is) one of the most important comics to watch out for.”– Punchline Magazine“Hunk” – East Bay Express.People really seem to like him.Please, go to Netflix and watch his comedy special "Moshe Kasher Live In Oakland." Please, read his book. Please, think of the children. Natasha Leggero is an actress, writer and accomplished stand-up who stars in the Emmy nominated series "Burning Love." She was on "The Comedy Central Roasts" of James Franco and Justin Bieber and can be seen regularly on "The Tonight Show," "Chelsea Lately" and "@midnight" and wrote and is starring in the hit Comedy Central series set in 1902, "Another Period. "She has appeared on TV ("Community," "It’s Always Sunny in Philadelphia," "Arrested Development," "Reno 911!") and in movies ("He’s Just Not That Into You," "Let's Be Cops," "Neighbors") and her voice can be heard on "Ugly Americans," "Brickleberry," "The Life and Times of Tim," "Aqua Teen Hunger Force" and "China, IL" on Adult Swim. You can also see her on "Marry Me," "Suburgatory," "Key and Peele," "Comedy Bang Bang" and "Drunk History" on Comedy Central.